We live in a world where technology dominates our daily lives. From watching TV, utilizing computers for work, video games for kids, and of course, staring at our smart phone for hours mindlessly scrolling through social media or playing games. It is pretty clear that the world would not be what it is today without technology. However, as technology rapidly grows with each passing day, its consequences are starting to catch up with our health and they are presenting us with serious problems. Recently, more and more children, teenagers and young adults are developing hunchbacks due to the poor posture associated with constant use of cell phones and other devices with screens. It’s even become common in parents, the middle-aged and the aging populations. We used to associate bad posture, slouching shoulders and a hunchback as a sign of old age or a symbol of depression, weakness and an inferiority complex. Now, even the strong-willed, the leaders and the empowered are developing hunchbacks while they are young. 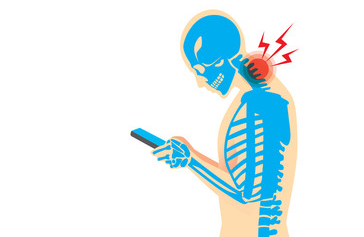 No matter what piece of technology you use, your neck and nerves may be paying the ultimate price. For every inch you look down at your phone, the weight of your head increases by roughly 10 pounds. Multiply these by several hours a day, 7 days a week for months on end and what happens? This forward head translation places an enormous amount of stress on spinal bones, nerves and the muscles that control your head movement. It is not a coincidence that headaches and neck pain are increasingly being seen by chiropractors and other healthcare providers. Because your body is amazingly adaptable, the hunchback is your body’s method of adapting and coping with the stress that looking down on your phone places on your neck and spine. This body position can reverse the curvature of your neck and place additional stress on the entire spine and nervous system causing all types of health problems and accelerating spinal and nerve degeneration, interfering with your health on many levels both today and as you age. The nervous system is the master controller of your entire body, and it is imperative to make sure that it is healthy. Much like a cell phone requires a tower signal in order to send and receive calls and messages, your nervous system is your body’s natural IT system that is responsible for sending electrical signals to and from your brain so you can move, breathe, talk, and perform all of your favorite activities. When this system is interfered with, dis-ease sets in and manifests itself in a variety of painful, chronic and unfavorable ways. Straighten up. Don’t wait for a crisis! Be conscious of your posture when you’re on the phone. Make the health of your nervous system a priority with Chiropractic Lifestyle Care. Don’t let technology make you old before your time. Live your ideal 100 Year Lifestyle and unlock the potential that will allow you to live your best life, every day of your life.